One unhealthy food craving that I have not been able to quash completely has been my obsession with ice cream. I could give up all other desserts forever, but a life without frozen creamy goodness is not worth living. I’ve tried a few different protein-based ice cream and popsicle recipes in the past, but it wasn’t until I started using Dymatize Elite whey that I succeeded in making a popsicle that wasn’t hard as a regular ice cube. So in addition to Dymatize whey’s superior mixing properties and taste with plain water, milk, and soy milk and the effectiveness of its integrated lactase enzyme formula for lactose-intolerant systems like mine, I can happily report that the stuff somehow retains a softer, fudgsicle-like consistency when frozen. I made the following popsicle recipe this weekend and tested it on my picky husband. He loved them and said that he couldn’t tell they were mostly protein. No additional sweeteners were needed since the protein powder and pudding mix were already sweetened. 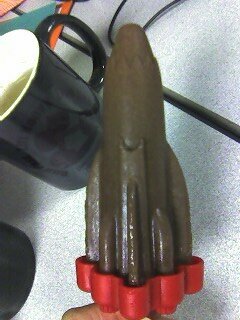 I get 8 rocket-shaped fudgesicles out of this recipe, and eat 2 of them as a snack with 1/2 oz. of nuts or by themselves if I just need a protein boost. Mix the ingredients together according to the instructions on the pudding mix box. Pour into popsicle forms, ice cube trays, paper or paper cups. Freeze for several hours until solid. This recipe sounds fantastic. I cannot WAIT to try it. Say, what system do you use to track your nutritional intake? Excel? Online service? I’m using Sparkpeople and wondering if there’s something better. It tastes remarkably like the Fudgsicles of my childhood and yet works with my current plan to consume great quantities of protein. Thanks!